Dear faithful customers: as of October 1st, 2018, the publisher has limited the availability of their titles in Canada, narrowing the channels through which they choose to offer them(!). We recommend you to our neighbours and close colleagues ParentBooks. 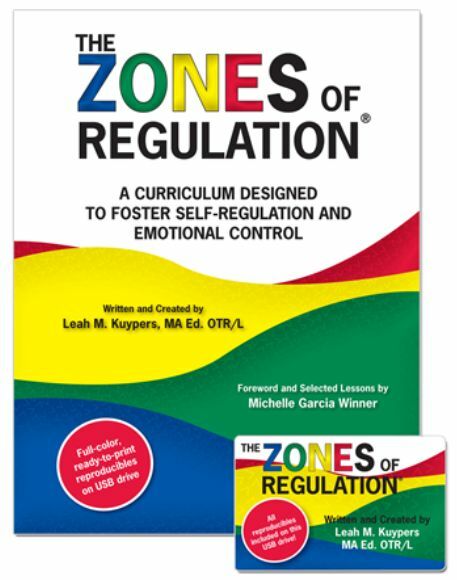 The Zones of Regulation®, (2011, Social Thinking Publishing) is a curriculum comprised of lessons and activities designed by Leah Kuypers, M. A. Ed., OTR/L to help students gain skills in the area of self-regulation. The lessons and learning activities are designed to help the students recognize when they are in the different Zones (states of alertness/moods) as well as learn how to use strategies (including sensory supports, calming techniques, and thinking strategies) to regulate the Zone they are in. In addition to addressing self-regulation, the students will be gaining an increased vocabulary of emotional terms, skills in reading facial expressions, perspective on how others see and react to their behavior, insight on events that trigger their behavior, calming and alerting strategies, problem solving skills and much more. *The curriculum may appeal to parents interested in teaching their child self-regulation strategies, though this will require some modification of learning activities on the parents end and may require the support of a professional. The majority of the lessons are written to be conducted in a group format though can be modified to work with an individual. The curriculum has successfully been adapted to reach a population with mild to moderate cognitive challenges, but the learning outcomes will differ.